Toto, we're not in Portland anymore. Those words flew by in my head, just as the past week had gone, as I walked through the Las Vegas airport with my luggage late Thursday night. I was now surrounded by a different crowd, slot machines, and banners with promises of entertainment. Finally home but only for six more hours. On Monday afternoon I flew in to Portland with one of my co-workers, another person would follow the next day. It was sprinkling rain and cool with temperatures in the 50s as I had expected. 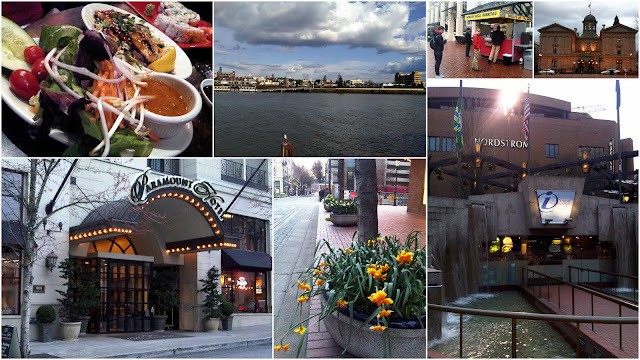 We stayed at the Paramount Hotel, in the heart of downtown Portland and a stone's throw from the Fox Tower where we would attend three full days of training for a new software our institution had purchased. Across the block there was an Italian restaurant called Pastini Pastaria where we stopped in for dinner. It was perfect for the evening, warm, cozy, and smelled heavenly of crusty bread, rosemary, garlic, and tomato sauce. 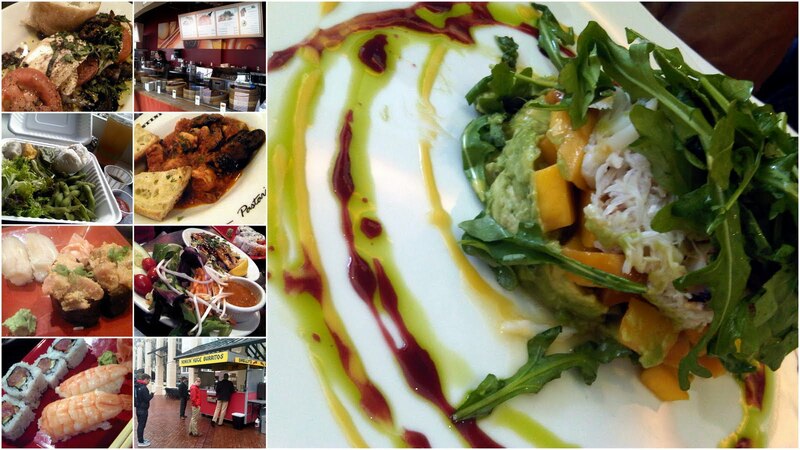 We had unlimited options for places to eat from food carts to Italian restaurants and Asian bistros to French cafes--all was just a stroll away. We ate at several places, I can only remember a few...including the Heathman Restaurant & Bar and Dragonfish Asian Cafe. Even in side our training room we had muffins, cookies, and coffee flowed all day. I haven't drank so much coffee in a week of my life as I had in the three days of training, LOL!! When we had free time after class, we walked down the blocks (and they are small blocks, not like Vegas street blocks--it's easy to overshoot) and went shopping. 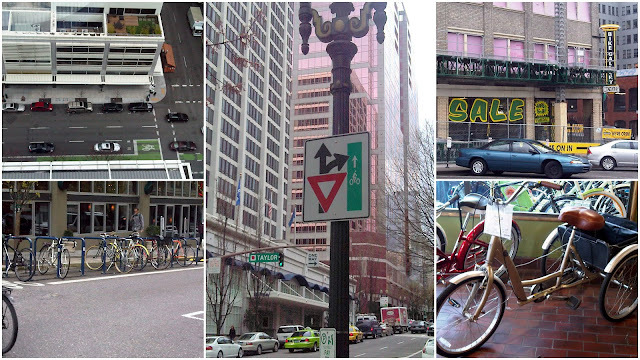 Down parks to Portland State University, a bike shop, apparel stores, and a LARGE bookstore called Powell's. What left the largest impressions in my mind was how clean the city streets are. There was no trash to be seen--even on the shady streets and light rail where I would have expected. Trash and recycling receptacles are accessible, especially at the airport. I was really impressed with how bike and pedestrian friendly the area is. The downtown traffic had just as many pedestrians and bicyclists as there were cars--and motor vehicles YIELD to them (even when a person is not at a crosswalk). Veins of bike lanes ran through all the streets, boundaries clearly marked, and there are plenty of places outside to lock up your bicycle and even designated parking spaces where cars would normally park. The design of the office building we were in (the Fox Tower) reflected the philosophy of the president of the company who believed that every person no matter where they were sitting would have a view of daylight and the scenery outside. We admired the panoramic view of the city from sixteen floors up as we toured the floor from where our training was conducted. Not only did the desks line the windows of the structure, the offices on the inside perimeter had a glass wall to see through to the outdoors. I really enjoyed our trip and came away learning not only about the intended purpose of why I was there but also about a city not very far away from where I grew up. I look forward to my next visit and hopefully the next time, the weather will sunnier and warmer!